Disney has released a new trailer and clip from Pixar’s latest film 'Brave,' directed by directed by Mark Andrews and Brenda Chapman and featuring the voices of Kelly Macdonald, Emma Thompson, Billy Connolly, Julie Walters, Kevin McKidd, Craig Ferguson and Robbie Coltrane. 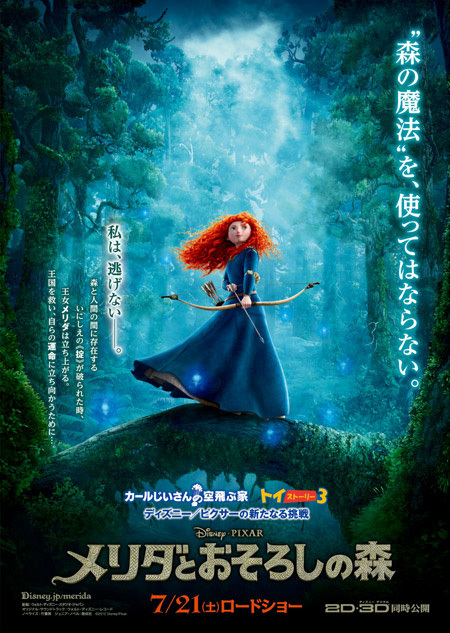 Also below is a featurette on the films leading lady Merida. Also figuring into Merida’s quest — and serving as comic relief — are the kingdom’s three lords: the enormous Lord MacGuffin (Kevin McKidd), the surly Lord Macintosh (Craig Ferguson), and the disagreeable Lord Dingwall (Robbie Coltrane). 'Brave' opens 22 June 2012 in the US, 17 August 2012 for Ireland and the UK.